I had originally signed up for this subscription in November and was informed that I would not be receiving my first box until March. Had to wait a long time, but I am definitely impressed. I have heard nothing but good reviews on the Topbox beauty subscription service and I believe my first box has lived up to the hype. First impressions: love the packaging! It’s a nice change from the square luxe boxes that I have been receiving. 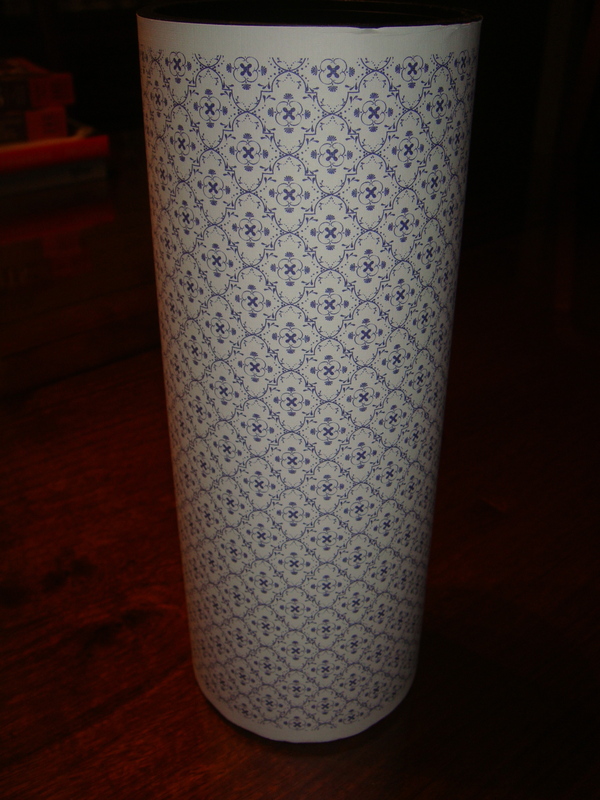 The cylinder does not have the top box logo on it, so I like that it can be reused as a container for a gift! I could also use it to store make up brushes or hold pens/pencils/hair ties.. the possibilities are endless. In my top box, I received a Cargo Cosmetics single eyeshadow in Georgia, a mark. Glossy Gorgeous Stay on Lip Stain in Frilly, mark. 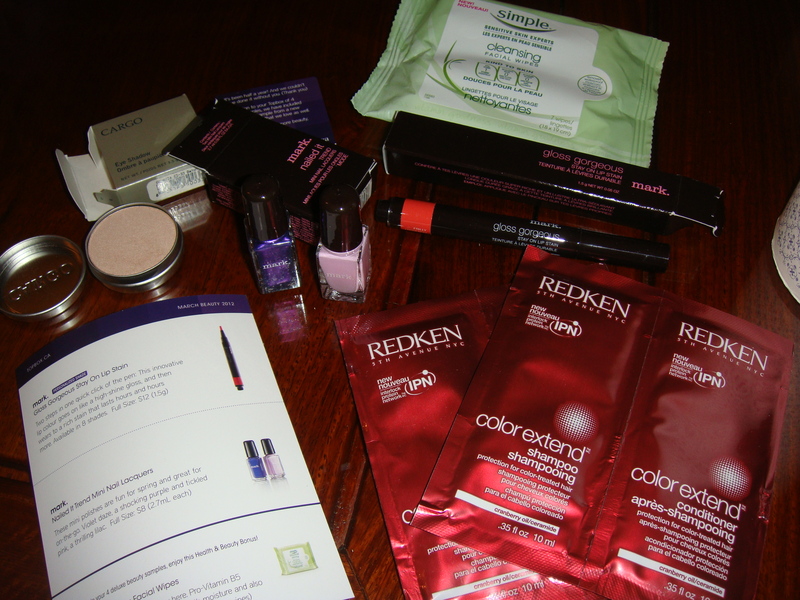 Nailed It Trend Mini Nail Laquers in Violet Daze & Tickled Pink, and 2 Redken Shampoo/Conditioner samples for colour treated hair. As a bonus, I also received Simple Cleansing Facial Wipes. The Cargo eyeshadow that I received is a lovely champagne colour that would work well as a base. From the looks of the colour shade on the outside of the the mark. Lipstain, I can tell that it is a nice coral colour. I will not be using it yet though as I have way too many lip products that I need to use up first! The two mini nail laquers are absolutely adorable! They are a good size as well in my opinion because who actually is able to use up a full size OPI or ESSIE nail polish before it dries up?! The colours are pretty and are perfect for spring. I would be thrilled to have received the Redken shampoo/conditioner samples if I had colour treated hair… Don’t think I will be using these! Lastly, the Simple cleansing facial wipes are something I look forward to trying. I currently use facial wipes to remove my make up every night so these will be put to good use. 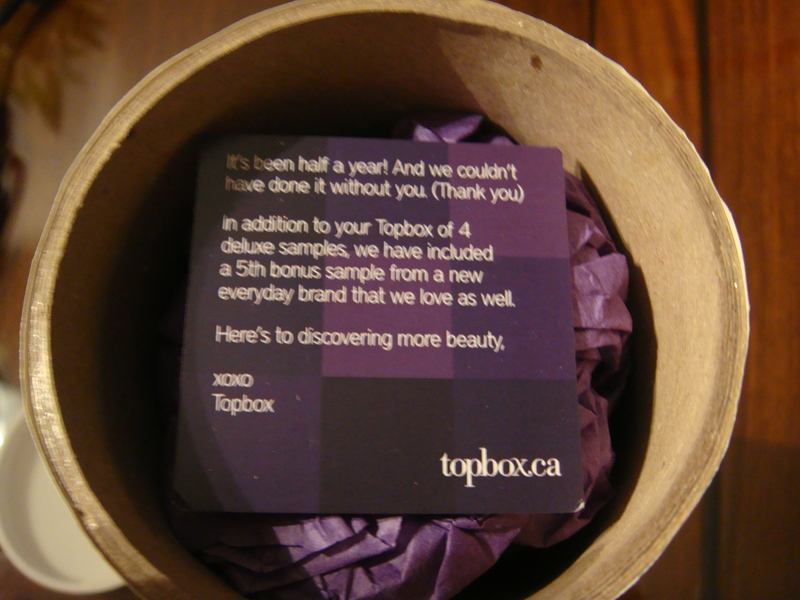 What did you receive in your Topbox? April 2010 Topbox « take her word. if you dont like perfume samples for luxe box you can request to have a fragrance free box! and you should also email them about repeat items. they say they will give you a bonus item next box! By the way, how would you compare your Luxe Box and Topbox? Your review on the 4 boxes is very informative! Thank you for that. I can’t make a thorough comparison right now as I have only received 1 Topbox so far.. But from the first topbox, I like how there are more makeup products. In my recent luxe boxes, I notice that I’ve been receiving more body/face products (i.e. lotion, toning gels, creams etc.) which is nice, but I’d prefer more makeup products to try out. Also, in my luxe boxes, I’ve been receiving a lot of perfume samples lately which I am not too fond of because I don’t usually wear perfume. I have also received a couple of repeat products in my luxe boxes in the last couple of months. How disappointing! Repeats are no good – especially within a short period of time! I really want Topbox, too (mostly because of the cute cylindrical container haha) but I guess I’ll just have to wait :( Thanks for the comparison! Wow, a 4 month wait? They only told me that I’d get an email when it’s available. Didn’t get any mention of how long it’d be… So I signed up with Glymm and Glossybox, instead. I can’t imagine being on the wait list! The good thing about Glymm & Glossybox is that you get points right? And then you can redeem points for boxes.. That’s kind of neat. Wish top box & luxe box had that..